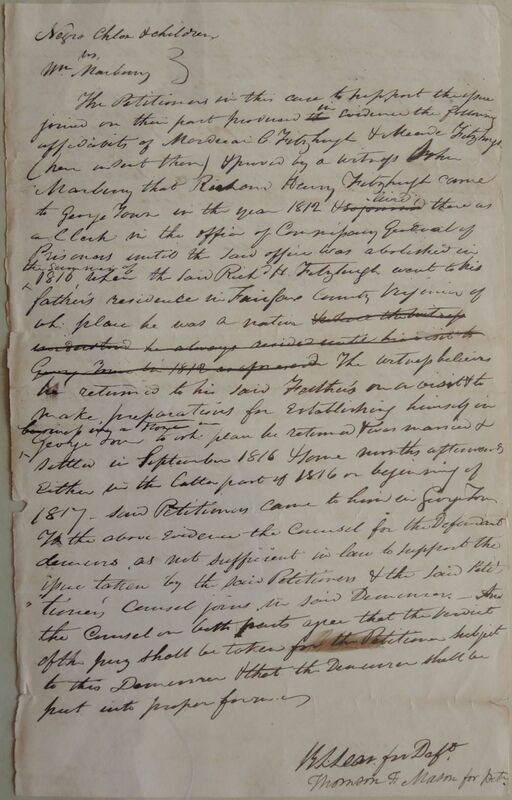 The Petitioners in this cause to support the issue joined on their part produced the in Evidence the following affidavits of Mordecai C. Fitzhugh & Meade Fitzhugh (here insert them) & proved by a witness John Marbury that Richard Henry Fitzhugh came to George Town in the year 1812 & sojourned lived there as a Clerk in the office of Commissary General of Prisoners until the said office was abolished in the summer of 1816, when the said Richd H. Fitzhugh went to his father's residence in Fairfax County Virginia of wh: place he was a native & where the witness understood he always resided until his visit[?] to George Town in 1812 as aforesaid The witness believes he returned to his said Father's on a visit & to make, preparations for Establishing himself in business in a home[?] in George Town to wh: place he returned & was married & settled in September 1816 & some months afterwards either in the latter part of 1816 or beginning of 1817, some Petitioners came to him in George Town. To the above Evidence the Counsel for the Defendant delivers as not sufficient in law to support the issue taken by the said Petitioners & the said Petitioner's Counsel joins in said Demurrer. And the Counsel on both parts agree that the verdict of the Jury shall be taken for the Petitioner subject to this Demurrer & that the Demurrer shall be put into proper form. Thomson F. Mason for Petr. 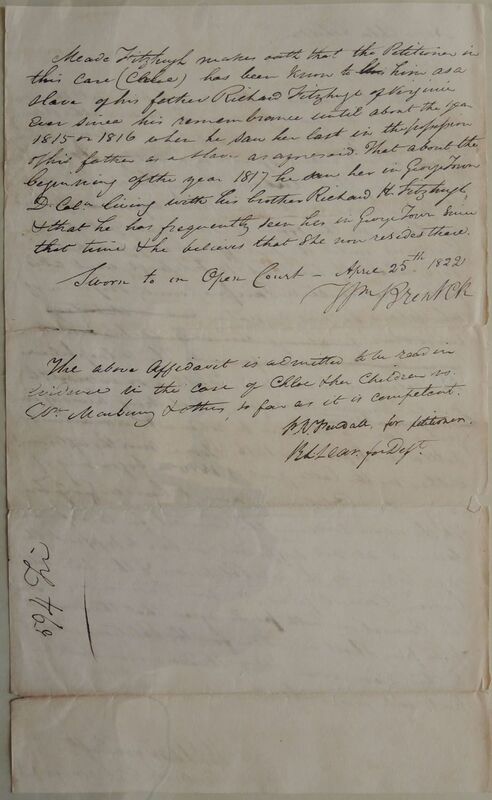 Meade Fitzhugh makes oath that the Petitioner in this case (Chloe) has been known to this him as a slave of his father Richard Fitzhugh of Virginia ever since his remembrance until about the year 1815 or 1816 when he saw her last in the possession of his father as a slave as aforesaid. That about the beginning of the year 1817 he saw her in George Town D. Cola. living with his brother Richard H. Fitzhugh, & that he has frequently seen her in George Town since that time & he believes that she now resides there. The above Affidavit is admitted to be read in Evidence in the case of Chloe & her children vs. Wm. Marbury & others, so far as it is competent.